We’re just over three months from the official launch of Marvel Studios’ “Phase Two” of their cinematic universe when Iron Man 3 hits theaters on May 3. Today, President of Production Kevin Feige updated MTV with plans for future big screen entries that look even further into the future. 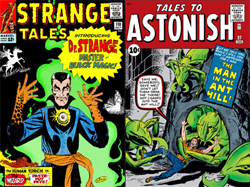 Ant-Man, he says, will officially launch “Phase Three” and early plans also call for the long-rumored Doctor Strange to be included. The official line-up for “Phase Two,” then, includes Iron Man 3 in May, Thor: The Dark World on November 8, Captain America: The Winter Soldier on April 4, 2014, Guardians of the Galaxy on August 1, 2014 and, finally, The Avengers 2 on May 1, 2015. That’s all in addition to the upcoming “Marvel’s S.H.I.E.L.D.” television series, now filming its pilot episode. After that, there are several new characters being considered for features. Check back for updates on the future of Marvel on the big screen as they become available.